Xero is an online accounting system based in New Zealand. 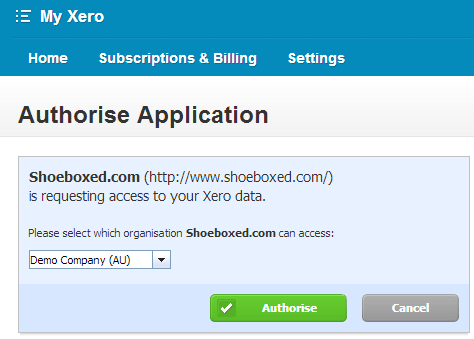 Your Shoeboxed account directly integrates with Xero. Want to connect the two? By default you will be able to export your documents as draft bills, but you will have the option to choose to export as approved bills. Please note that your Xero user needs Xero Standard privileges with Non Cash Coding and No Reports, as a minimum Xero privileges required for the integration. Importing Your Xero Chart of Accounts. Select "Export All" from the Receipts tab Then choose Other. From the Shoeboxed Export Expense page Scroll down to the Import Chart of Accounts option. Choose Xero from the drop down button and then click Import. 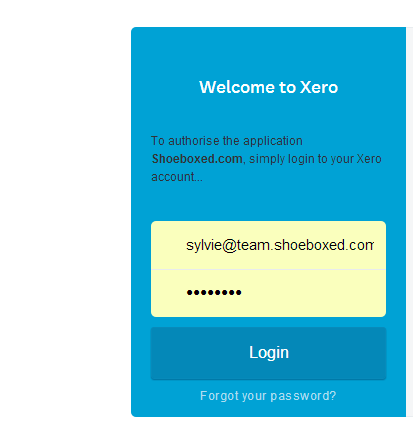 You will be prompted to authenticate with your Xero account. Once you have entered your credentials you will be able to choose a respective Xero account. Go to your receipts tab and then start categorising your receipts using the Xero chart of accounts category (you will notice that there's the word "Xero" in front). Select the Export All and choose Other under the receipts tab. 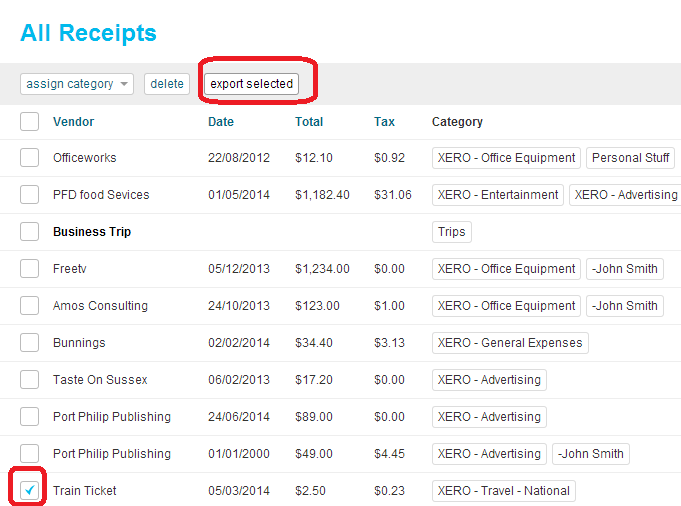 Alternatively you can select the individual receipts you want exported and choose the Export Selected button. Either option will take you to the Export Expenses page. Then select Send to Xero. 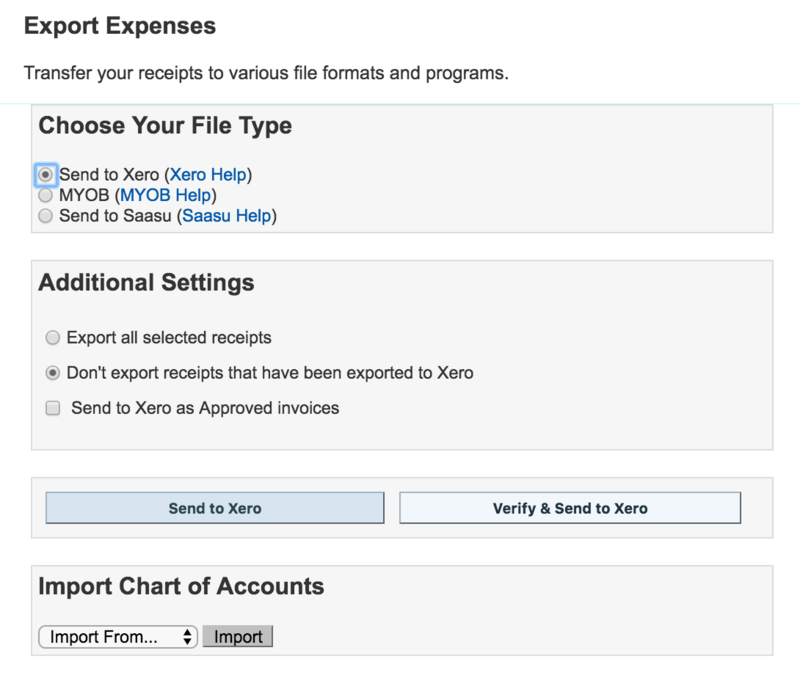 By default the option "Don't export receipts that have been exported to Xero" is chosen where the system will pick only documents that haven't been exported. If you want to export receipts that were previously exported please use the "Export all selected receipts" option. You can either use the "Send to Xero" button but we recommend using the "Verify & send to Xero". The verification page provides an easy way to check, recode your receipts or add any missing codes before exporting. If you click Send to Xero, you will skip the verification stage. Otherwise, you will be taken to this screen where you can add category or modify them. During the verification process if you notice any yellow flag you can safely ignore them as they are only for information about the gst, but if there's a red flag this meas that the GST amount is more than 10%. Please use the (Calc GST) button to correct it before exporting as Xero doesn't allow any items with GST higher than 10%. Click the Finish Export button where you will be taken back to the export screen with a summary of how many receipts were successfully exported. By default, your receipts will be export as "Draft bills". You can access draft bills either from (Invoices Owed to you) section from the Xero dashboard or from the menu bar (Accounts>>Purchases>>Bills). 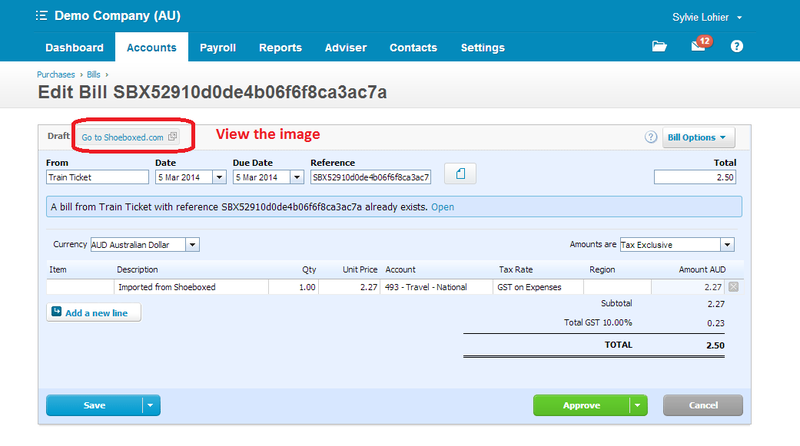 During the process of exporting to Xero please tick the check box of (Send to Xero as Approved invoices). Note that to export as approved bills it is mandatory to have a Xero category for all your receipts. Keep in mind the (Verify & Send to Xero) process where you can quickly categorise your receipts if it's missing.